Food Costs > How Much Does Parmesan Cheese Cost? How Much Does Parmesan Cheese Cost? Parmesan cheese, which is Parmigiano Reggiano, is a type of hard cheese that originated in Italy, but it is now widely produced and used worldwide. The term “parmesan cheese” actually doesn’t even exist in Italy as it’s an American name and is used as a term for various simulations of the cheese. Parmesan cheese is distinctively salty, has many uses, but it is mainly used for toppings on pasta and pizza. It is also used as an ingredient for different sauces. 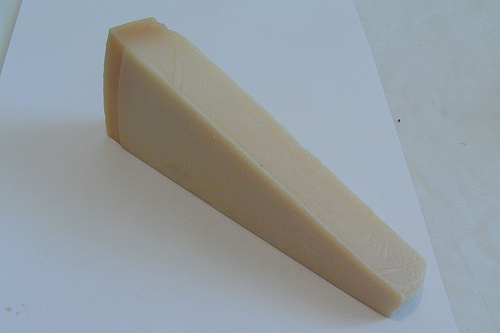 Real Parmesan cheese, which is referred to as Parmigiano Reggiano, can come as a wedge/block or even as a whole wheel. This cheese is often aged for 24 to 48 months and can cost about $15 to $20 per pound. For instance, a 28-month aged two pound Parmigiano Reggiano on Amazon.com retails for close to $35. Belgioioso, a popular parmesan brand, cost about $7 to $10 for an eight-ounce wedge. A wheel, which can weigh close to 80 pounds, can cost closer to $900 to $2,000, depending on who you purchase the cheese from. This 24-month wheel at Costco retails for $900. Authentic grated parmesan cheese can cost about $20 per pound, while unauthentic cheese, such as Kraft, can cost about $5 per eight ounces. Most of these commercially produced cheeses will have anti-caking ingredients which can prevent the cheese from incorporating into the sauce. This cheese will be created in as an 80-pound wedge and will be sliced into wedges and sold individually. While consumers can purchase a wheel as a whole, this is often rare and only purchased by restaurants or those who need it in larger quantities. Parmigiano Reggiano is rich in protein, calcium and is a dense cheese made partly from unpasteurized cow’s milk. As the cheese ages, it will result in a lower water content, offering even the littlest slice a punch of flavor. Olioandolive.com says a half an ounce will have more protein than a serving of chicken. Authentic Parmesan cheese will have no additives and no artificial flavorings. The only natural ingredient added during the process will be salt, which can help enhance the flavor. The cheese is known for a sharp, nutty flavor that has sort of grainy texture. Oftentimes, it will be used as a grating cheese, but it can be used for other culinary purposes as well. Some online retailers, especially if purchasing authentic cheese overseas, may have small shipping fees depending on how much you’re buying. While optional, a parm cheese grater is recommended if you plan on grating the cheese. A highly rated one can cost $15 to $20 on Amazon.com, for instance. The process is actually quite time-consuming and very labor intensive. During the process, the cheese will be made from a blend of cow’s milk: a full cream and a skim milk. The milk that comes from the cows will only come from those that were raised on grass and hay, which can create a unique texture. It’s then left for 12 months in wheels that can weigh a bit more than 80 pounds. After these 12 months are up, a certified inspector will inspect the cheese and see if it passes inspection. If it does, it will receive the Consortium’s seal, identifying as being authentic; it will also note the production date and the dairy ID number. Depending on the producer, it may be left to age or it will be sent out for sale. When purchasing legit Parmesan cheese, it’s best to look for cheese that has an even coloring on the outer edge of the cheese. Try to avoid any cheese that has any type of discoloring. If purchasing by the rind, it’s best to look for cheese that isn’t cracking. Keep in mind that most of the grocery store parmesan cheese isn’t truly “parmesan” cheese. Instead, this is processed cheese not used from the real cheese. In order to get a true, legitimate parmesan cheese, consider looking for popular Italian brands such as Parmigiano-Reggiano. In the past, for instance, it was found Kraft had wood chips in its parmesan cheese. This cheese can be stored in the refrigerator for up to five weeks. After five weeks, the flavor and texture will start to wear away, and it will lose its flavor and texture. Before storing it in a fridge, be sure to wrap it with wax paper and re-wrap again with a clean piece of paper. Note the date to make sure it doesn’t go past its expiration date. The cheese can go bad, but it will be able to outlast the “sell by date.” On average, it’s good for up to eight months after the expiration date. A good substitute can include Romano, Manchego or Asiago. As for the rind, a comparable substitute includes the Pecorino Romano and Gruyere. Romano vs parmesan – the difference? Both kinds of cheese are hard and will be dry. Each one will also be grated and served over salads, pasta and some vegetables. They both have originated in Italy, too. However, Romano was first produced in Rome, while Parmesan originated in Parma. In terms of texture, Roman will be hard and grainy, usually made from sheep’s milk, while Parmesan will be made from cow’s milk.